A relaxed tour through Cornwall and the Isles of Scilly. Explore Cornwall from top to bottom before heading across the Celtic Sea to the idyllic Isles of Scilly. This gentle 11-day tour starts on Padstow’s Camel Trail before bearing south to Falmouth, past the famous St Michael’s Mount to Penzance. Climb aboard The Scillonian ferry to the stunning Isles of Scilly where you’re free to island hop and discover the sandy white beaches, bronze age ruins and quaint villages the Scillies are so famous for. Alternatively try our extended 14-day Cornwall and Isles of Scilly Tour for a longer trip. 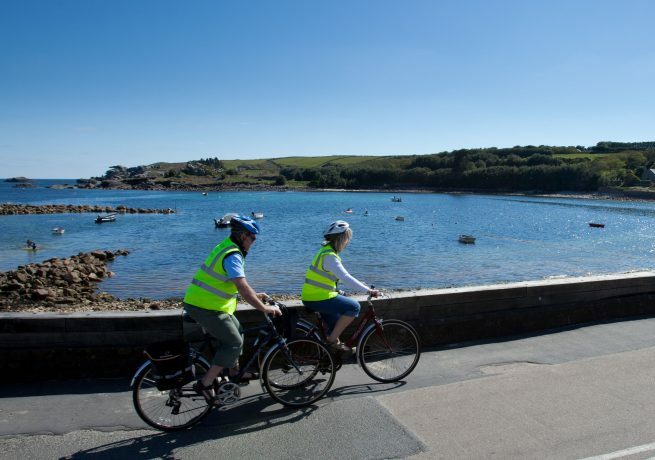 Cycle hire: Add £120 including two days hire on Isles of Scilly per person. 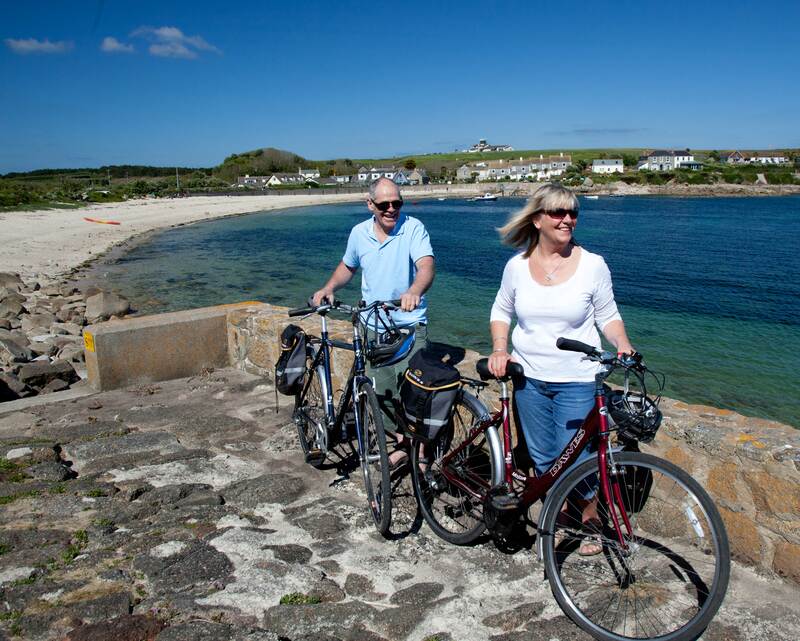 Electric cycle hire: Add £240 plus £30 for Isles of Scilly normal bike hire per person. Scroll down for our tour highlights. Bodmin Parkway station or Newquay Airport to Wadebridge; St Just to Penzance station. 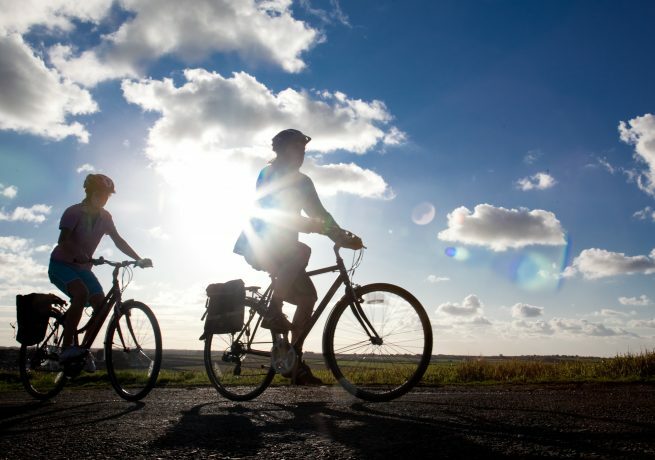 Leaving Wadebridge, your tour begins with a gentle cycle along the Camel Trail. Following the river towards Bodmin, you’ll pass the 18th century Bodmin Jail and the Bodmin and Wenford Railway, where steam locomotives still ride the rails. Then it’s on to the unspoilt village of Lanlivery and a stop at The Crown Inn, a 12th century longhouse. The Crown Inn, Lanlivery The Crown Inn in Lanlivery is one of the oldest pubs in Cornwall, offering relaxed bed and breakfast accommodation. Besides the B&B accommodation, The Crown Inn also serves award-winning food and drink for lunch and dinner every day of the week. The Crown Inn has been sympathetically restored to its original style. The bar is an atmospheric place to enjoy a drink or a meal alongside the roaring log fires. The Crown Inn has nine comfortable en suite rooms, all awarded 3 Diamonds by the AA. In the morning you will pass The Eden Project and ride along parts of the Clay Trails. Then it’s on to the historic port of Charlestown which was used as a location for filming Poldark and Jane Austin’s Persuasion. There is also a shipwreck museum here where you will see some spectacular tall ships docked, and The Rashleigh Arms is a great lunch stop. The day’s destination is Mevagissey, a small working fishing village with narrow streets filled with gift shops, cafés, galleries and pubs. Boscombe Bed and Breakfast, Megavissey Boscombe Bed and Breakfast is a small, family run B&B with a genuine warm and welcoming atmosphere run by hosts Andrew and Lynn Marshall. The Edwardian dwelling is set in large landscaped private gardens on the fringes of the picturesque fishing village of Mevagissey, and is only just a few minutes stroll from the traditional working harbour, shops and restaurants. The B&B features three en-suite guest bedrooms set in a warm, contemporary atmosphere. 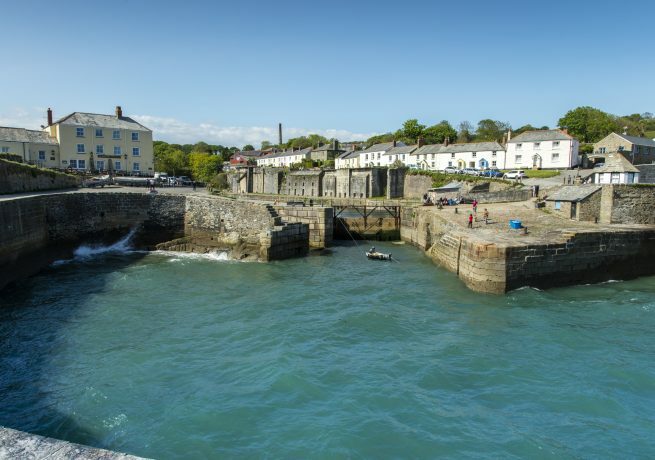 From Mevagissey the route takes you through country lanes, past beaches and the impressive Caerhays Castle, deeper into the beautiful Roseland Peninsula. 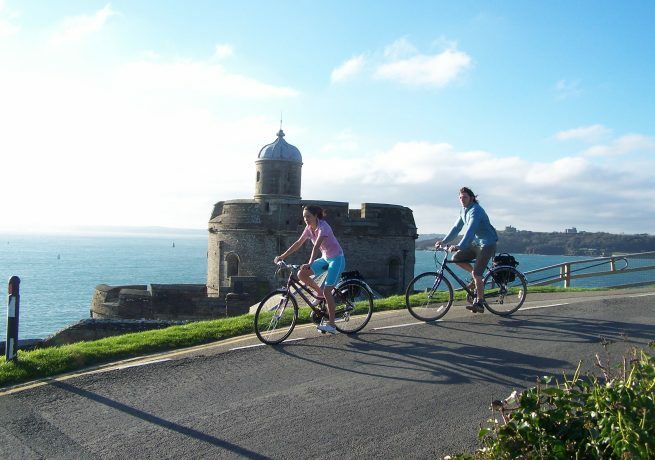 Here you pass St Mawes Castle, one of Henry VIII’s coastal fortresses, before coasting down the hill to the beautiful scenic village of St Mawes, where you catch the ferry to Falmouth. Falmouth is home to the world’s third largest natural harbour and the National Maritime Museum. The Gyllyngvase House Hotel, Falmouth The Gyllyngvase House Hotel offers quality accommodation and all the facilities of a small hotel. This is a friendly, family run hotel, and is situated 200m from the seafront at Gyllyngvase beach with Falmouth town centre and historic harbour just a few short minutes walk away. The Hotel has thirteen bedrooms, comprising of doubles, twins, family rooms and singles. Paul and Emma Lower are the proprietors of this family run hotel and have many years experience in tourism and hotels and will personally supervise all your arrangements during your visit. 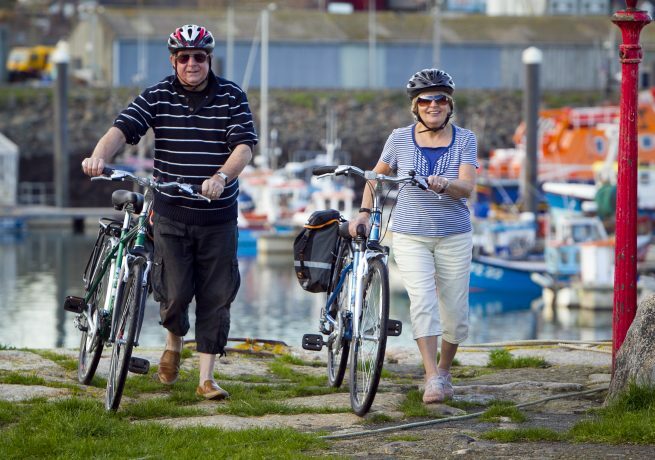 From Porthleven you cycle along coastal lanes to the seaside village of Marazion, which affords breathtaking views over St Michael’s Mount and Mount’s Bay. 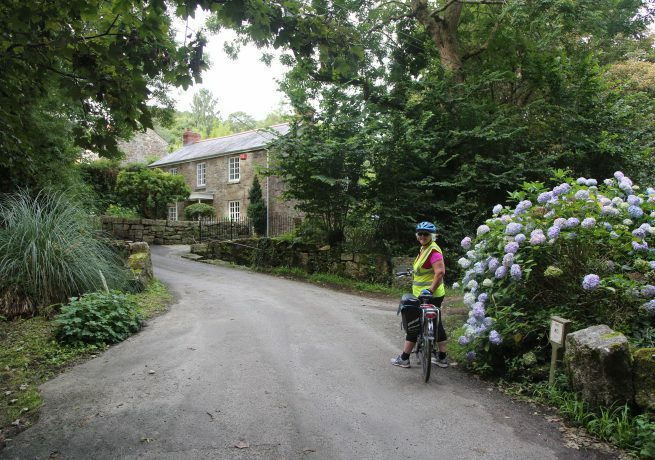 From Marazion there is an easy, level ride around Mount’s Bay to Penzance and neighbouring Newlyn. Both towns have large harbours and big fishing fleets, so there is always plenty going on here. The Yacht Inn, Penzance The Yacht Inn is right in the heart of Penzance with most rooms overlooking the harbour towards the sea. There are seven en-suite rooms, including one with a desirable balcony view for watching the sunset. The Yacht Inn prides itself on serving delicious, locally sourced food from pan-roasted duck to shellfish from nearby Newlyn. It is just a few minutes walk from the harbour, perfect for catching The Scillionian the next day. From Penzance, catch The Scillonian ferry from the Lighthouse Pier to St Mary’s on the Isles of Scilly. The crossing takes approximately two hours and 45 minutes. Dolphins and porpoises are often spotted swimming alongside The Scillonian’s bow. You will arrive on St Mary’s, the biggest island, where you will stay for the next three nights. Just 2.5 miles wide, St Mary’s makes the perfect base to explore the isles. It boasts beautiful golden sand beaches, crystal clear waters and cosy pubs which can be easily discovered by bicycle in one day. Westford House, St Mary’s Westford House is nestled in Hugh Town, just five minutes from the ferry quay. This 19th century Georgian townhouse has five en-suite bedrooms, all named after the different islands that make up the Isles of Scilly. The large airy guest lounge has a television and massage chair to relax in after a long day exploring the islands. The Scillonian even offer to deliver your luggage from the ferry to the front door of Westford House for just £1.30 per item. You will stay here for the duration of your time on the Isles of Scilly. 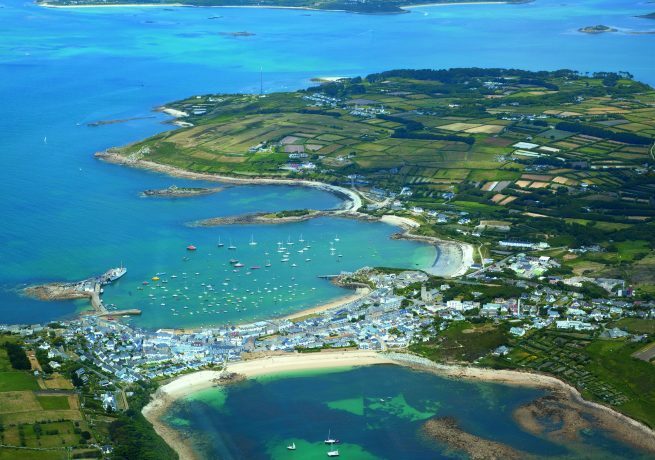 Five inhabited islands – plus over a hundred more – make up the Isles of Scilly; St Mary’s, Tresco, St Martin’s, St Agnes and Bryher. There’s no set trail, so you are free to explore them as you please. All the islands are easily accessible by boat through St Mary’s Boatmen Association. 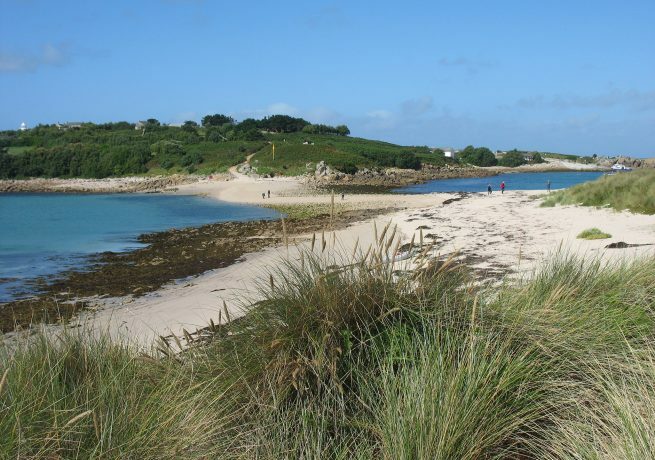 If you want to spend the day in St Mary’s, Porthcressa Beach is a beautiful spot for snorkelling and you can discover the Bronze Age village at Halangy Down. Tresco is the second largest and only privately-owned island. Make sure you stop by Tresco Abbey Gardens and marvel at the 20,000 exotic species on show, most of which cannot be grown anywhere else in Britain. Westford House, St Mary’s Westford House is nestled in Hugh Town, just five minutes from the ferry quay. After another night’s rest at Westford House. Why not explore St Martin’s? Swim in the sandy white crescent of Par Bay and you may spot some seals sunbathing on the rocks. Adam’s Fish and Chips is a good place to stop for lunch too. St Agnes is on the most southwesterly tip of the Isles of Scilly. Walk across the sandbar to the uninhabited island of Gugh. Back on the mainland, explore the quaint cottages and flower fields before finishing off with a cold pint at Britain’s most southwesterly pub, The Turk’s Head. Finally, if you still have time, take a boat to Bryher and go kayaking around Green Bay before watching the sunset at Popplestones. Say farewell to the Scillies and board The Scillionian back to Penzance. If you haven’t already, walk along the road at low tide and explore St Michael’s Mount, a medieval castle and the home of Lord St Levan. Spend the evening back in The Yacht Inn before the cycling recommences tomorrow. The Yacht Inn, Penzance You will return to The Yacht Inn, the same B&B as before your journey to the Isles of Scilly, situated right in the heart of Penzance. 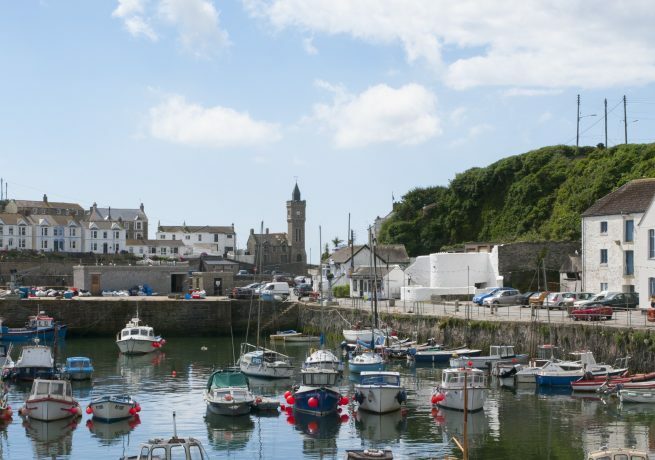 From Penzance, the route takes you past the tiny coastal hamlet of Lamorna – a popular subject for the Newlyn School of artists in the late nineteenth century. Further west is Porthcurno, home to the Minack Theatre, a unique auditorium and stage carved into the cliff above the sea with performances throughout the summer. From Land’s End, England’s most westerly point, it is possible to see the Isles of Scilly on a clear day, so keep an eye out. Then it’s on to one of the most ancient mining districts in Cornwall, St Just. Cornwall’s mining heritage is clearly visible here, with the spectacular clifftop scenery studded with mine engine houses and chimney stacks. The world’s largest indoor rainforest is a must visit when in Cornwall. 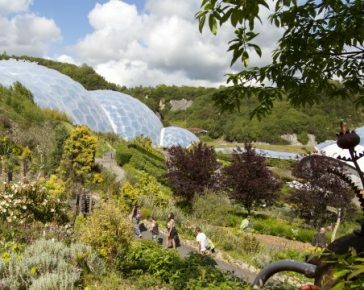 Explore its colourful gardens and towering biomes, and enjoy food from the Eden Kitchen. 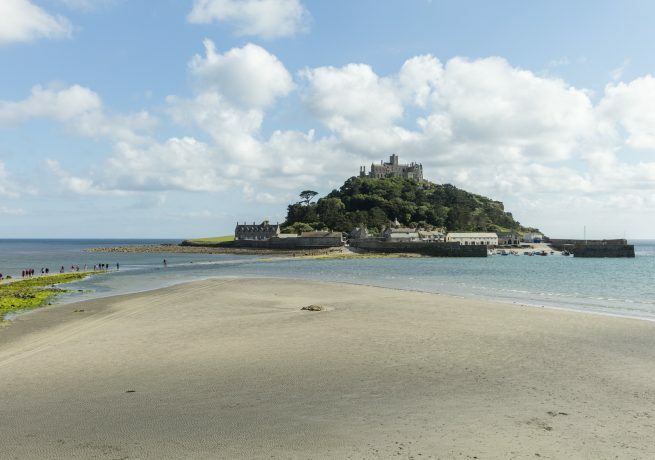 Famous for its granite causeway which appears at low tide, this medieval castle and church lies on a rocky island in Mounts Bay. The subtropical island on the Isles of Scilly is home to Tresco Abbey Garden, award-winning restaurants, the island spa, and miles of white sandy beaches.